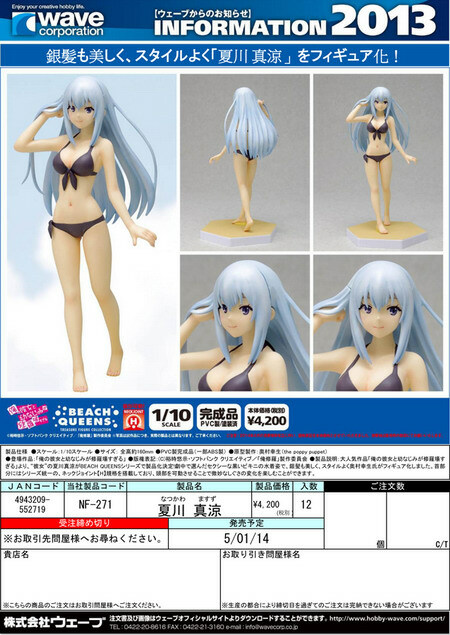 November 15th, 2013 By: GGT Category: 2014/05 release, Figure News. WAVE is going to release the Treasure Figure Collection Beach Queens Natsukawa Masuzu ( 夏川 真涼 ) 1/10 PVC figure from the light novel/manga/anime “Ore no Kanojo to Osananajimi ga Shuraba Sugiru” ( 俺の彼女と幼なじみが修羅場すぎる ). Will be released in May 2014. Around 160mm tall, 4,200 yen.